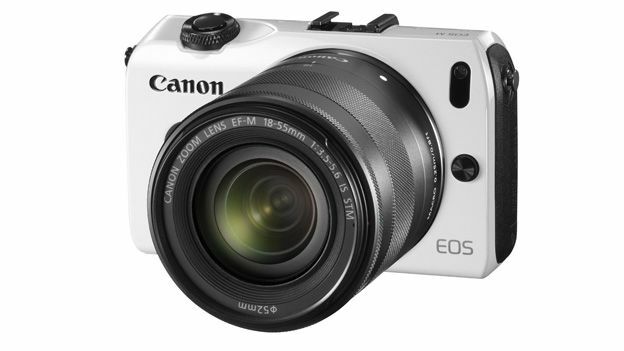 Canon has launched the EOS M – its first CMS (Compact System Camera). The firm claims it has ported a lot of its higher-end SLR expertise into this smaller camera, and with interchangeable lenses represents something of a hybrid. It has an 18 MP APS-C hybrid CMOS sensor, and a 7.7cm Clear View LCD II Touch screen, which you can use to select different shooting modes and settings. It can shoot full HD video with stereo sound, and any one of Canon's range of EF lenses can be connected via the new Mount Adapter EF-EOS M.
As well as this the EOS M launches with its own bespoke range of compact accessories – the EF-M 18-55mm f/3.5-5.6 IS STM standard zoom and the EF-M 22mm f/2 STM pancake lens. Additionally, the EOS M will ship with the new Speedlite 90EX flash unit as standard. It will cost from £769 to £949 depending on the accessories bundled.